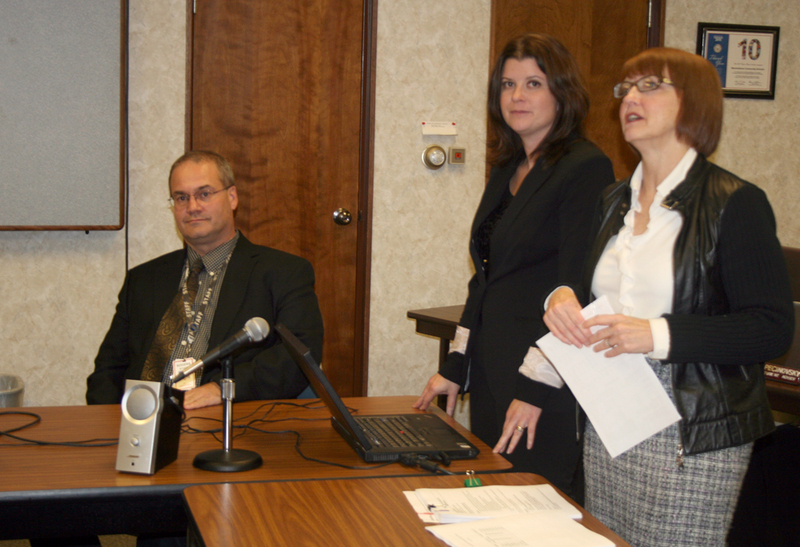 L to R: Dr. Mick Jurgensen, Clarissa Thompson and Arlene McAtee tell the Board about the success of Rogers University. The great success of Rogers University, the six-week summer education program at Rogers Elementary, was highlighted during Monday’s Board meeting. Arlene McAtee, executive director for Mid-Iowa Community Action, along with MICA’s Clarissa Thompson and Rogers principal Dr. Mick Jurgensen shared data about student growth in reading and math and how students, parents and teachers could see the benefits when school resumed in the fall. Rogers University was made possible by a 21st Century Learning Community Grant received by MICA. The program served 114 students (78 K-3 and 36 Preschool) from June 20 to July 29 (Preschool program ran June 20-July 1). During the six weeks each student followed an individualized education plan with clear goals and routine monitoring of progress. Each day students began with breakfast, followed by reading or math lessons taught with a 5-to-1 student/teacher ratio. After lunch, students took part in enrichment activities including art, drama, technology, physical activity, life skills and service learning. The program also included a Family Literacy and Parent University component, with GED and ESL academies being most popular. “We want to wrap the community in support around the school,” McAtee told the board, saying the goal is to create a “culture of success” for students and the community. Student progress was monitored according to whether or not they met their individual goal, if they regularly exceeded baseline, and if there was an upward trend line. More than 95 percent of student met at least one of these criteria in reading and nearly 93 percent did the same in math. A survey of parents during fall conferences showed 100 percent of parents believed Rogers University helped students be better prepared for school in the fall, with 73.1 percent noting a significant benefit. Planning is already underway for Rogers University 2012. The Board approved the voluntary early retirement program for the 2012-2013 school year. The program offers qualifying early retirees continued insurance coverage until Medicare-eligible or for 96 months. The policy also states that the district will pay any insurance premium increases up to 5 percent – anything over that is covered by the retiree. The early retirement incentive is paid through the district Management Fund, which is also used to cover workers’ comp and property/casualty insurance. Business Operations Director Kevin Posekany told the Board the fund continues to be healthy as each year approximately the same number of people leave the early retirement program as enter it. The early retirement incentive is already in place for 2011-2012. Eligible employees looking to take advantage of the incentive this school year must apply by Dec. 1, 2011. The Board approved the scope of work for work at Support Services, formerly Anson Middle School. The project includes demolition of the 1925 building and remodeling in order to move the district central office to the upper floors of that building. The project would also create a separate entrance with stairwell and elevator to the central office. The local of the 1925 building will be graded down and turned into parking. The project also included an option to demolish a garage at the bus barn, but the board voted 4-1 to pull that out of the scope of work and deal with it as a separate project. This evening, the Board of Education chose to extend the District’s Voluntary Early Retirement Incentive Program into the 2012-2013 school year. Teachers wanting voluntary early retirement at the end of the current 2011-2012 school year have until Dec. 1, 2011, to notify the District of this intent. Those planning voluntary early retirement at the end of the 2012-2013 school year have a notification deadline of Dec. 1, 2012. I encourage any teacher who is contemplating retirement to closely examine the Licensed Teaching Staff Voluntary Retirement Incentive Program policy. This policy, number 407.6, can be found by going to the District website (www.marshalltown.k12.ia.us) and clicking on “School Board.” Click on a link at the bottom of this page called “400 Series – Personnel” (under the heading Board Policy). I hope everyone has a safe, restful and enjoyable Thanksgiving. Learning about the successes of the Rogers Neighborhood Project (Rogers University) was the main focus of tonight’s Board meeting. The six-week summer educational program shows what happens when community leaders from a variety of entities come together for one purpose: to increase student achievement. Arlene McAtee, Director for Mid-Iowa Community Action, the lead agency on this grant supported initiative, shared a powerful and energetic message stressing the importance of reducing educational gaps for our students, especially those who live in poverty. McAtee and MCSD’s own Dr. Mick Jurgensen, Rogers Elementary principal, shared that the cost of running this summer program was approximately $1200 per child, kindergarten through third grade, and $361 for pre-school. The investment to those children will far outweigh the costs; by using several educational assessments the teachers have demonstrated how summer programming increased reading and math scores and reduced the loss many children experience due to being away from school during the summer months. Students identified to participate in Rogers University were done so because they were below proficiency in math and reading. Clarissa Thompson, also with MICA, shared astounding data; over 75 percent of the kindergartners through third graders who participated showed significant upward trends in both math and reading on the weekly assessments. In addition, all students participated in 60 minutes of health and wellness physical activity per day stressing the importance of nutrition and health. The partnership between the school district and the numerous agencies that were apart of this magnificent opportunity leads me, as a board member, parent, and community partner, to understand how we continue to strive for new innovative ideas that will lead us toward our end goal of being Central Iowa’s school district of choice. Brittney Benson, Franklin paraeducator, effective Nov. 22, 2011. Geoffrey Gimse, District Network Specialist, effective Nov. 30, 2011. Stephen Jensen, MLA paraeducator, effective Nov. 11, 2011. Shelly Dall, MHS food service. Start date: Oct. 10, 2011; Salary: $9.84/hour. Melissa Seltman, Fisher/Lenihan Literacy Intervention Tutor. Start date: Nov. 28, 2011; Salary: $18.80/hour. Sheyla Abazan, Anson Bilingual Tutor. Start date: Nov. 22, 2011; Salary: $11/hour. Brian Bown, MHS assistant debate coach. Start date: Nov. 8, 2011; Salary: $2,424/year. Randy Peterson, MHS assistant drama coach. Start date: Nov. 8, 2011; Salary: $507/year. Patty Nevarez, Franklin paraeducator. Start date: Nov. 21, 2011; Salary: $8.47/hour. Kim Cole, Miller food service. Start date: Nov. 21, 2011; Change to $10.34/hour, 5.25 hours/day. 204.3 Closed Sessions, initial review, changes to reflect changes in legislature. Marshalltown Schools are seeking a waiver from the Iowa Department of Education to create a “New Innovative Calendar” for the 2012-2013 school year. Dr. Susan Pecinovsky, associate superintendent for student achievement, told the Board there was no definitive plan right now for what an innovative calendar would look like, but the waiver application is the first step in the process. Once it is approved at the state level the District can look at creating a calendar that better meets the needs of students. In the application to the state, Dr. Pecinovsky explained that changes in the community mean a need for changes in the structure of the school year. Out of approximately 5,100 students, 15 percent leave for extended periods in the winter months to visit family in Mexico. Additionally, 41 percent of students are designated as English Language Learners and 66.2 percent are eligible for free and reduced lunch. “We have quality instructional opportunities and are limited by the structure of our calendar,” Pecinovsky said in the application. It is not known when the state will act on the application. The Board discussed continuing the voluntary retirement incentive program Monday night, reviewing the policies and planning to bring it back for formal approval at the Nov. 21 meeting. The policies (Board Policy 314.1 and 407.6) will be brought back for approval on Nov. 21, which would open the window for the 2012-2013 school year with a deadline of Dec. 1, 2012. 2. Follow the law and your own policy. 3. Respect the chain of command. 4. Base decisions on shared, objective information. 5. Operate in the public eye. This evening Dr. Pecinovsky reported that the district has applied for permission from the state to have a more innovative school calendar for the 2012-2013 school year. The application is the first step that has to be taken so we can begin to be more creative in ways to help all of our students reach their full potential. We don’t know yet exactly what that innovative calendar may look like, but this writer feels confident that we will be seeing more flexibility in scheduling—perhaps more opportunities for summer learning, perhaps more opportunities for extended days, or perhaps more days in the school year. This is good news for all of our students. Jennifer McDonald, shuttle driver, effective Oct. 28, 2011. Laura Stansberry, Franklin paraeducator, effective Dec. 22, 2011. Gloria Stanton, MHS paraeducator, effective Oct. 31, 2011. Ricardo Perez Ibarra, Anson Bilingual Tutor, effective Nov. 4, 2011. Lucinda Coleman, Woodbury paraeducator, effective Oct. 19, 2011. Allie Osmundson, MHS assistant girls basketball coach. Start date: Oct. 18, 2011, salary: $3,668. Mary Ann Wallace, Miller food service. Start date: Oct. 3, 2011, salary: $9.58/hour. Danielle Gavagan, Franklin food service. Start date: Oct. 18, 2011, salary: $9.58/hour. Barbara Bringle, Woodbury food service. Start date: Oct. 14, 2011, salary: $9.58/hour. James Johnson, substitute bus driver. Start date: Oct. 14, 2011, salary determined by route. John Saunders, substitute bus driver. Start date: Oct. 20, 2011, salary determined by route. Leslie Fisher, MHS paraeducator. Start date: Nov. 8, 2011. Salary: $8.47/hour, 7 hours/day (6 hours/day on Wednesday). Juana Zacarias, MHS paraeducator. Start date: Nov. 8, 2011. Salary: $9.48/hour 7 hours/day (6 hours/day on Wednesday). Wendi Hunt, Woodbury paraeducator. Start date: Nov. 8, 2011. Salary: $9.48/hour, 6.5 hours/day (5.5 hours/day on Wednesday). Tomarra McManus, food service. Start date: Aug. 22, 2011. Change to Miller. Sandra Fetters, food service. Start date: April 8, 2011. Change to Lenihan. Jodi Garcia, food service. Start date: Nov. 2, 2010. Change to Miller. Angie Dickey, Lenihan paraeducator. Start date: Nov. 7, 2011. Change to 6.75 hours/day (5.75 hours/day on Wednesday). 605.3 Student Promotion-Retention, waive second reading; 804.2 Video Surveillance and Electronic Monitoring, will bring back for second reading and review the regulations at the same time. 202.5 Board of Directors’ Conflict of Interest; 401.2 Employee Conflict of Interest; 401.5R Employee Records Regulation, new regulation; 701.3 Fund Balance Reporting and Governmental Fund Type Definitions; 801.6 Selection of an Architect, major revision; 705.1 Purchasing Policy, major revision.